The following is a brief history that we have on the airframe. If anyone can confirm or add to these details any information would be much appreciated. 12/2/57: 7 Sqn RAF Honington where it remained until July 1960 (except for going to Vickers / Marshalls for modifications). 16/10/61: 138 Sqn RAF Wittering. 25/4/62: 232 OCU RAF Gaydon. 5/12/62 - 25/2/63: Vickers for Mods. 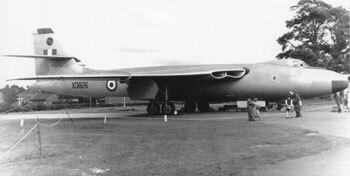 4/3/65: SOC and allotted to Feltwell as Ground Instructional Airframe 7872M. 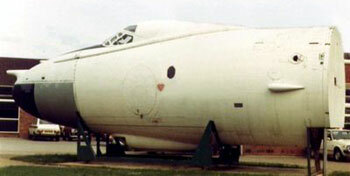 Nose section as NBS Trainer. Aim of restoration: To restore XD826 to B1 standard. Can you help find the following ? Instruments, morse key, refuelling nozzle, escape hatch, squadron patches, Valiant Pilot's notes, aircrew equipment and flying clothing, photographs or videos of XD826 in service. 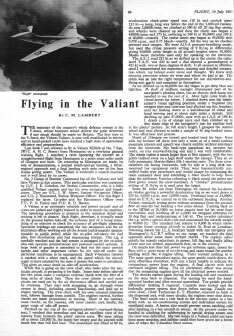 We have been granted permission by Flightglobal to reproduce the following article from Flight magazine dated 19th July 1957, when a journalist was given the opportunity of flying in XD826 of 7sqn RAF Honington on a two hour training flight, the actual aircraft we are currently restoring. The above document is in PDF format and will require Adobe Reader (or similar) to view.